~ HR Giger, Cinephage magazine, 1992. That Giger was one of the twentieth century’s foremost talents is no hyperbole. That he fathered a radically different and disturbing aesthetic is no exaggeration. That he influenced and will continue to influence generations of future artists needs not be prophesied. Biomechanics is HR Giger. O’Bannon had not only set out to write Alien with a “Giger monster” specifically in mind, but also fought the film’s producers to get Giger personally involved in the production of the film. The producers themselves, unimpressed by the notion of some “whing-ding” from Zurich working on their movie, preferred to hire someone from Hollywood; someone with other movies under their belt and reputable contacts in their phone book. Hiring an unknown European artist seemed laughable. Enter Ridley Scott, who found Giger’s Necronomicon thrust upon him by an eager O’Bannon. Scott looked through the book and was astounded. He threatened to walk if Giger was not hired. The producers acquiesced. Ridley explained that “My enthusiasm with regard to the film increased significantly as I realized we had the ability to create a monster that would be superior to most of those from the past.” Giger’s signature mesh of bone and machines, interlaced with decay and sexuality, would give Alien the unique ingredient it needed to distance itself from other standard sci-fi fare. The Giger circle has been kind to Strange Shapes and myself. No consolation can truly dull the pain of their loss, but we offer them anyway. 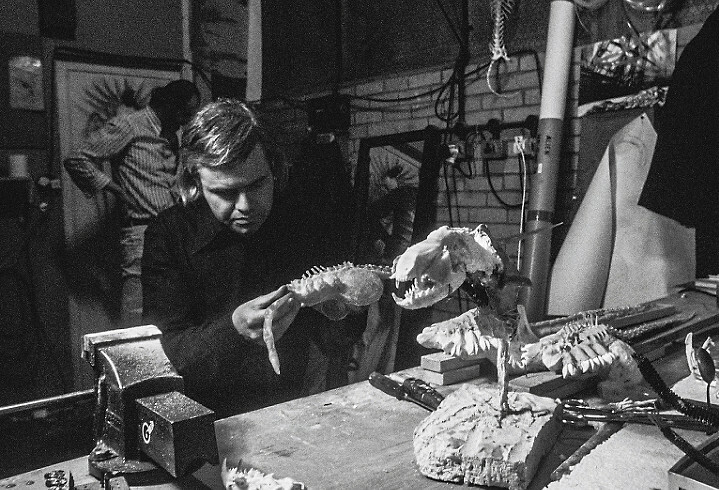 Our condolences go to Carmen, his wife of eight years, his friend and agent Les Barany, and the many close associates and assistants that gathered around, helped and contributed to the last years of Mr. Giger’s extraordinary life. Rest In Peace H.R Giger. Thank you for sharing your talent with so many people, and thank you for bringing us the most memorable extraterrestrial in all time. As Jodorowsky has said in twitter: “Good bye dear H.R Giger, you’ve returned to your world”. At the risk of stating the obvious, the men and women who have been made famous in great works of art, and BY great works of art (as Giger was), pass on as time goes by, one by one. For another recent example, you need only look at Harold Ramis. They’ll all be gone, some day; we will be able to recite their names in much the same way as Ripley listed her fallen crew near the end of Alien. And yet they are, in their own way, immortalized, preserved for as long as media lasts. Giger may have passed on, but we can see the fruits of his work at any time — just pop in a DVD, Blu-Ray, or even a tape recording of Alien, sit back, and enjoy the ride. With that, permit me to take up the refrain: thank you for the nightmares! In addition to being a superbly crafted film with evocative visuals, I am thankful for Alien because, for me, it peopled the dark with beautiful monsters. Nice article. Can’t imagine Alien without Giger. Props to Dan O’Bannon (RIP) and Ridley (long may he reign) for their ability to recognize such a talent and to fight to get him in the film. Seems rather ridiculous that anyone would have to fight to get anyone so talented into a cheap (budget-wise) monster movie. Giger’s passing has absolutely devastated me. I was severely depressed all day yesterday after hearing the saddening news. It’s strange how some deaths really affect you and others do not. Sure, it’s always unfortunate to hear of someone’s passing, but certain ones truly have a way of really knocking the wind out of your sails. Giger’s definitely did that to me. I think, at least for me, part of it is that such tremendous artists and visionaries who create all of these amazing, wondrous things just don’t seem human somehow. In your subconscious, you really associate them with being more than just a normal, everyday person on some levels, and you almost forget that they’re just like the rest of us in many ways. That they’re still only flesh and bone, and that we all have to and will depart from this existence sometime, somehow. It’s a difficult thing to put into words. Regardless though, the incredible work they’ve done lives on, and by extension, so do they. I think that ultimately makes the frustrating reality of it all much more tolerable. I’ve had an unhealthy obsession with Giger’s original Xenomorph design since I was a kid. It absolutely terrified me to the point that I remained oddly transfixed and captivated by its power, naturally growing into studying and learning more about its creator and his work as I matured and became able to completely appreciate and fully understand it. Ever since those early teenage years, Giger became a beloved hero to me. His work is instantly recognizable and its impact unparalleled. A true original. There’s just no mistaking a Giger piece. I think some artists are so haunted and ravaged by their own nightmares that it becomes their indirect duty to help the rest of us better understand and appreciate our own. Their art, be it paintings, music, film and so forth helps speak towards facing our own personal monsters and attaining a form of catharsis where we can learn to live with them. Giger was one such person whose ability to tap into his own darkness helped the world embrace and understand much of its own. His vision and aesthetic ushered in a new artistic age that continues on as we speak. I hope it never ceases in doing so. Personally, I would give just about anything to live on the Nostromo and wander its dark and dangerous corridors. Oh sure, I most likely wouldn’t last very long, but that’s how deep my strange obsession with this monster lies. Alien truly means that much to me. Part of me will always be immersed in that place, and in that story. Giger’s beautiful creature and the world he helped to create around it left an impact on me unlike any other. Such an affect can only speak volumes as to the legacy of Giger, his visions, and the work he left behind. Additional thanks are also indeed in order to Dan and Ridley for insuring Giger had the largest stage upon which to play and share his talents for an unprepared world that would forever be scarred by his creations and the nightmares they would inspire. May those same nightmares continue to evolve and never end. Finally the Nightmare , that was Giger himself , has mercifully passed from this life. His work shall live on and continue to show humanity the depths of its own capacity for depravity & degeneracy. I once told a friend in Wash.D.C. that if they brought a retrospective of H.R.Giger the only appropriate environment for it , IMO, would be the Holocaust Museum. Am I wrong? I was influenced by his Sc-fi work first encountered by his iconic album cover art for Emerson, Lake, & Palmer’s album *Brain Salad Surgery*. ELP, with Emerson’s other-worldly uber-Moog synthesizer & the mix of classical symphonic themes , were as Jules Vern-class sci-fi gothica in and of itself as it could get. And then there was Giger’s 1973 album cover that crystalized ELP’s sci-fi theme. This was way before *Alien*. and became revulsed by all of the degenerate immersion into death camp perversions alloyed with the filth of the dark occult. Yes, he was the pathogen of 20th century European culture come out to show itself for what it was and apparently still lingers on alive and well and run rampant in her Giger. still lurking in the slime of the darker side of the human subconscious. Yeah, I see all of the lust degenerated into the lust for blood in glorifying the grotesque that one , I would think ,should wish be healed of. Why would one glorify a raging Cancer of the spirit. for the future that the germ of degeneration is alive and well and rather dstill very virulent. Yes, he is the creator of biomechanics which chased away all of that phoney gee-whiz cheeswhiz of the Disneyfied -future and wiped that stupid smiley face off of *Star Wars* & *Close Encounters of the Third Kind* forever , but it was a necessary lesson to be learned, so long as we’ve actually learned it. Thereis nothing to glorify in the crushed bodies of Tiananmen Square, but her Giger thought was obviously helpless to create no other aesthetic but embracing the blood-lust of the grotesque, the Macbre as the term of art of salesmen of this genre *prefer* such as the Hansen galleries who were the original sellers of Giger art in Manhattan,and the original publisher of the *Necronomicon* book when he won the oscar for his Alien design ( I was there and was told thus in person ), to use to make it all sound somewhat classier. Garbage in, garbage out no matter how brilliantly slick & science fictiony & stylish it is packaged as. The medium is the message. But the good news is that he was recognized for his skills, accomplishments and value as a human being. And it seems that he generally found a way to live his life the way he preferred. Thats all anyone can hope for.